So this whole nomming adventure was kudos to Alice. It all started when we both started talking about how we wanted to pay a visit to Pomme Frites -- it would be my second visit since my first visit five years ago and Alice's first ever. She broached the subject, a month or so before, about poutine -- French-style cheese fries with gravy -- and said we needed to try it. Scoutmob had a deal that was to expire on the thirteenth of November -- one that was just TOO good to pass up (more on this later), so we scurried over there that Sunday evening. However, once Alice met up with Marcus and me, we realized that just having pomme frites for dinner would not be the wisest idea (would we be fully enough? ), so we decided to have a "light" dinner before. 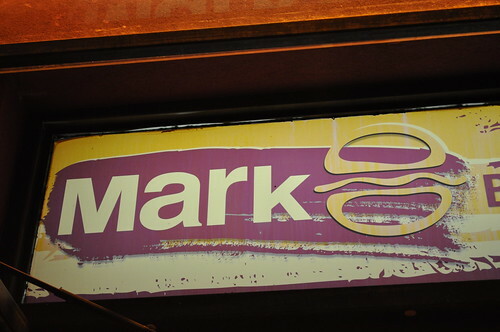 Alice suggested we try Mark, a few blocks from Pomme Frites -- she had heard great things about the famed sliders on its menu, so we figured it would be worth a shot! The bacon sliders at Mark is testament to the common tenet that bacon does indeed make anything and everything better. It is a cardinal rule in all things gourmet and culinary -- no matter if you're a food snob or an average joe. Its savory, greasy, and crispy glory will always speak for itself. You'll see why shortly. So beer and sliders it was. Each table has an assortment of homemade condiments -- jalapeño-honey sauce, barbecue sauce, chipotle ketchup, and dijon mustard. 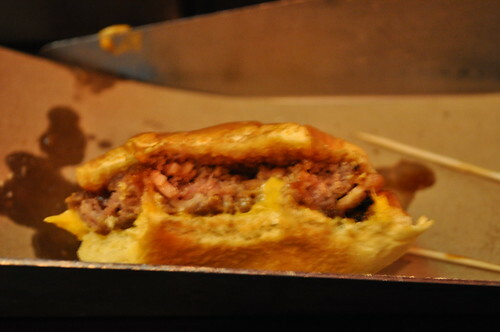 Why Mark has bragging rights to serving the "Best Slider in NYC" is that the bacon contained in the slider is not simply on top of the miniature patty -- it is incorporated inside of it. Yea, you heard me -- a slider with bacon infused within its interior. Enough said, right? The menu already had me at "bacon," which I hadn't realized was just the icing on the proverbial cake. 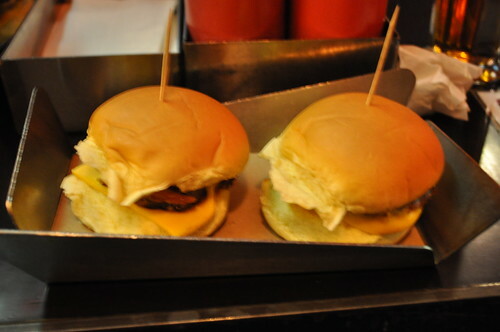 Each slider at Mark comes with cheese and onions unless otherwise noted to the waitstaff. I got my two bacon sliders with cheese only and sloshed on some sweet barbecue sauce on top. The fatty goodness is the kind that you imagine clogging your arteries, but you could careless because it is just that amazing. Two of these really hit the spot -- definitely one of the best sliders I've ever had! Makes for a great spot to go to after a late night of dancing and partying -- its greasiness and overall awesomeness will cure any onset of hangover coming your way. After sliders, we met up with a mutual friend of ours, Jenn, at Pomme Frites to use our Scoutmob deal on its very last day. I mean, c'mon! 100% off a regular order of pomme frites?! Who doesn't love free food? :D The only stipulation of this deal is that the only thing you'll need to pay for is the sauces (at $1 for each sauce or a combination of three for $2.50) in which to dip the pomme frites. Look at that smorgasboard of sauces to choose from! It was very difficult to narrow it down, but eventually, we came to a final decision. 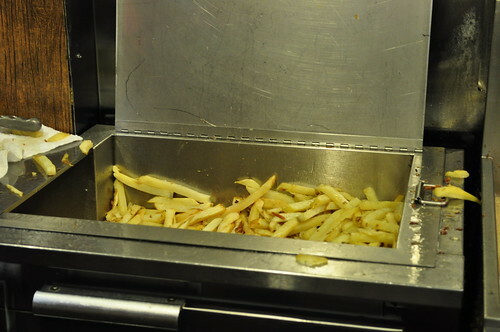 The pomme frites getting ready to be served and nommed! The lineup of condiments a-plenty. Between Marcus and myself, we had five distinctly different dipping sauces, which included, from top left going counter clockwise: mango chutney mayo (what the guy behind the counter said is the most popular one), wild mushroom mayo, Vientamese pineapple mayo, sweet chili, and peanut satay. Jenn ordered the mango chutney mayo as well, and Alice ordered the rosemary garlic mayo (not pictured above). I absolutely loved the mango chutney mayo (as did everyone else) -- it had a nice tanginess to it from the mayo counterbalanced by the creaminess of the mayo. My other favorite was the wild mushroom mayo, but does that really surprise you? Being the mushroom fiend that I am, it'd be crazy for me to not love it! Another favorite amongst everyone else was the Vietnamese pineapple mayo -- it had very Asian-inspired flavors, making it different from what you would normally expect from a typical condiment served with pomme frites or French fries. The sweet chili was a bit spicy for my liking, the peanut satay was just okay, and the rosemary garlic was pretty good overall. Alice seemed to be filled with many a brilliant idea that night -- we each had Groupons for the Big Gay Ice Cream Truck deal (i.e., two cones for the price of one) that was to expire at the end of November that we hadn't had a chance to use up (I had bought two total, only using one when I reviewed it here). 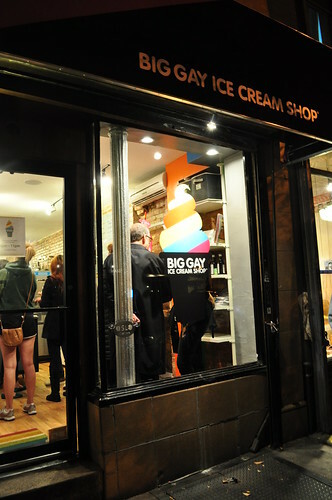 Big Gay Ice Cream had opened up an actual storefront to house its innovative confections, and apparently, the Truck was done for the Fall season. As such, I didn't realize the terms of the Groupon had changed for these very reasons -- the Groupon could be used at the "new" brick-and-mortar shop up until expiration date. 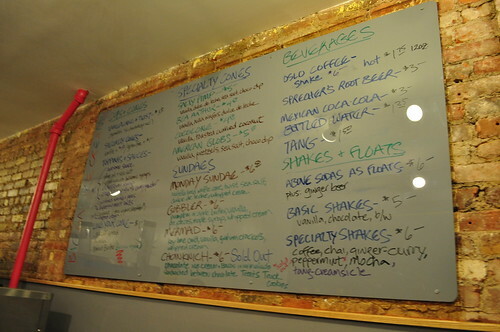 Here's the extensive menu over at Big Gay Ice Cream Shop, consisting of four different specialty cones, four different sundaes,and other assorted beverage/shake/create-your-own-sundae options. 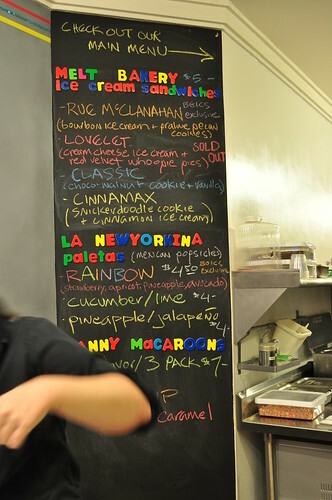 Alongside Big Gay Ice Cream Shop's original offerings, the Shop also offers desserts and treats from other snack vendors including Melt Bakery, La Newyorkina, and Danny Macaroons, among others. 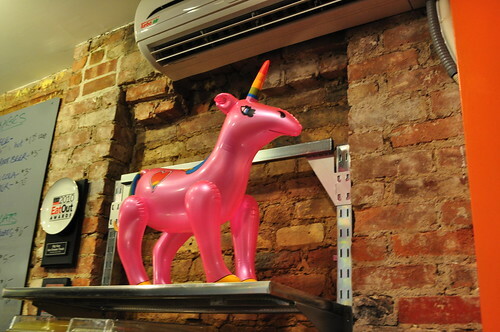 Inflatable unicorn -- love how it fits in with the whimsical design of the Shop's interior. 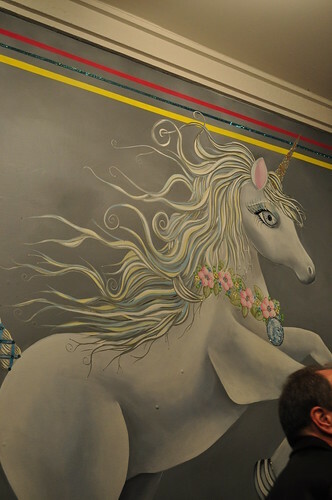 Another unicorn sighting, only this time it's a mural on the wall! Marcus, Alice, and Jenn decided to get the Salty Pimp -- a combination of vanilla soft-serve with dulce de leche, sea salt, and chocolate dip. Marcus said it was just as he had remembered it from our visit this past summer. A solid but soft chocolate exterior with the creaminess of the soft-serve, sweetness of the dulce de leche, and saltiness of the sea salt at its center made for a pleasant flavor so bittersweet. To try something other than the Salty Pimp that I had from the Truck, I decided to go with the specialty cone, American Globs, which had vanilla soft-serve with pretzels, sea salt, and chocolate dip. 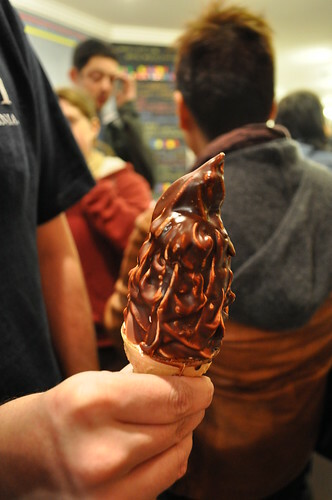 Very much like the Salty Pimp, American Globs features pretzels instead of dulce de leche, adding more crunch and saltiness to the overall specialty cone. 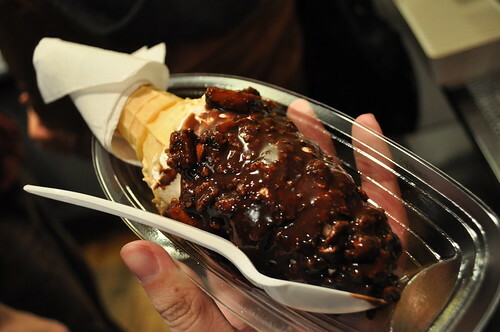 It had all the delightfulness from a chocolate covered pretzel with the added creamy soft-serve to balance out the sweet and salty flavors. Findings: All in all, I think we hit three great spots on our little nommin' adventure through the East Village. Mark had the most amazing bacon sliders that were the kind of greasy grub you hope for, especially on late nights; Pomme Frites had all of the sauces and condiments you could imagine (plus some more) for which you can dip your order of pomme frites; and Big Gay Ice Cream Shop had fun twists on classic soft-serve treats in a cone. We had a nice informal, three-course "dinner" pleasantly hitting all of the major tastes buds -- savory, salty, and sweet. We had a pretty complete, packed-in, and diversified meal -- all for under $15! Besides being easy on the wallet, these three places are definitely great places to go with a group of friends to catch up over some yummy comfort food -- sliders, fries, and ice cream are always okay in my book! Looking forward to frequenting these spots again really soon! 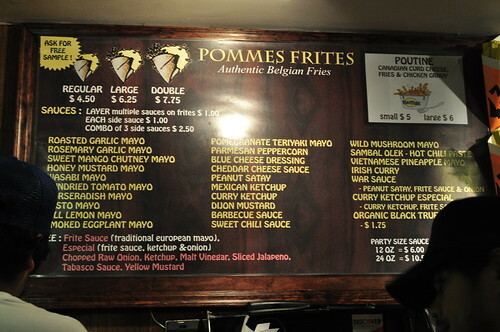 Price point: $2.95 for each bacon slider; $4.50 for a regular-sized order of pomme frites (free through Scoutmob! 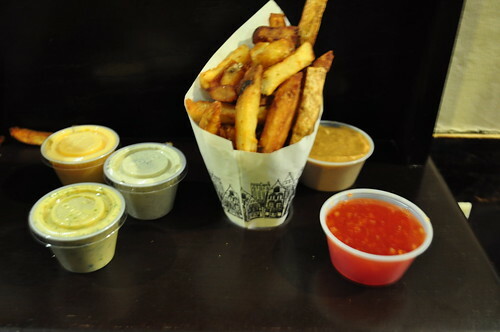 ), $1 for each pomme frite sauce, $2.50 for a combination of 3 sauces; American Globs regular-sized cone for $5, Salty Pimp regular-sized cone for $5 -- a total of $5 with Groupon! Pomme Frites deal was available here*! Big Gay Ice Cream Truck deal was available here*! * This deal is no longer available, as the event/deal has passed. As I couldn't make it to the Daniel Holzman and Michael Chernow cookbook signing, Marcus valiantly stepped in and went in my place. I'm so lucky to have a food-enthusiastic boyfriend who understands my madness, especially when it comes to cookbook signings! 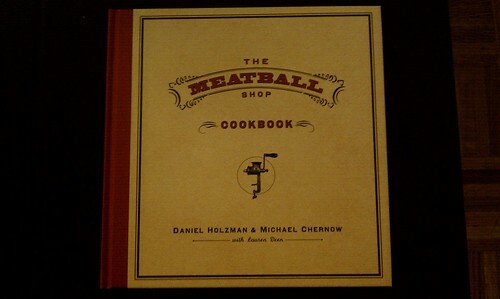 The Meatball Shop's chef and general manager, Daniel Holzman and Michael Chernow, recently co-wrote and published a cookbook filled with both classic and original recipes for recipes that their humble little shop (well, shops now!) located in the coziest of spaces in the Lower East Side. 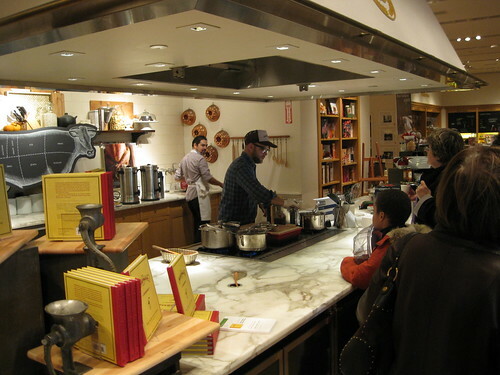 Williams-Sonoma hosted a demonstration and cookbook signing over at its Columbus Circle location on a Saturday afternoon. From Marcus's recapitulation of the demonstration and cookbook signing, Chef Holzman and Mr. Chernow were quite the humorous pair, breaking the ice with some quirky jokes. 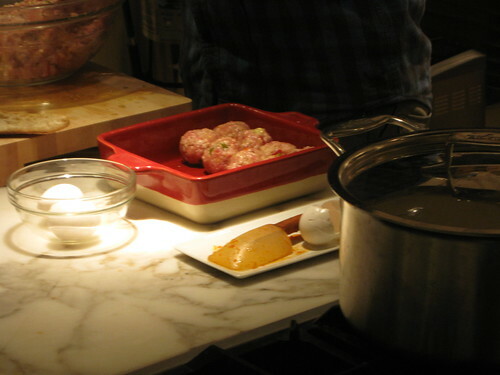 Chef Holzman finally stepped foot into the Williams-Sonoma kitchen to show-off some of his awesome meatball-making skills. 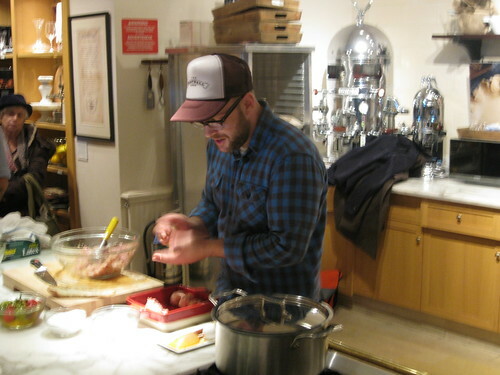 He prefaced the demonstration by delving into The Meatball Shop's philosophy behind making/cooking meatballs and how they've come to find success. 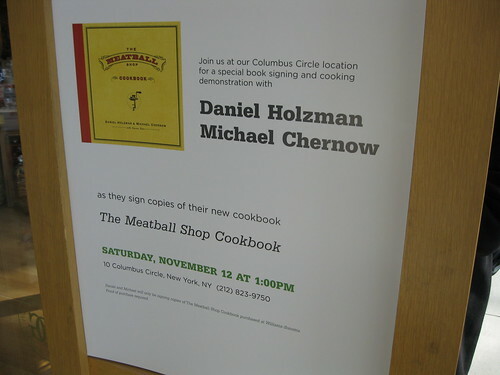 Ultimately, Chef Holzman reiterated, meatballs are peasants' food -- you just make them with whatever you have leftover. There is no need for crazy prep time. Nobody is really slaving over a hot stove over cooking meatballs because in practice, they're pretty easy. So when he used to visit his grandmother, she used to say she had been slaving all day over making these meatballs, and Chef Holzman fell for it every time. It wasn't until he was older and understood the "science" behind creating the "perfect meatball" that he realized the truth -- he teased that his grandma was pretty full of it because they really didn't take that long at all! Chef Holzman shaping the meatballs into the baking pan. He also noted that there's really no "wrong way" to make meatballs -- it will usually work out with whatever ingredients you choose and whatever size you make them. 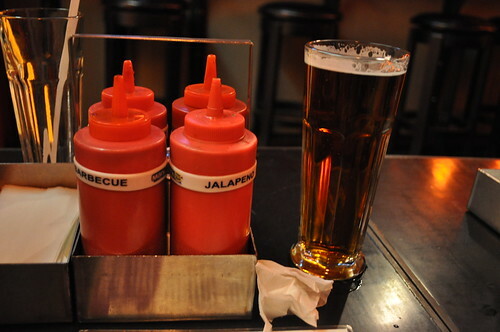 At The Meatball Shop, they just go with they make because they enjoy it. And since its patrons seem to be responding well to it, they figure they must be doing something right. Voilà! Meatballs ready for the oven! 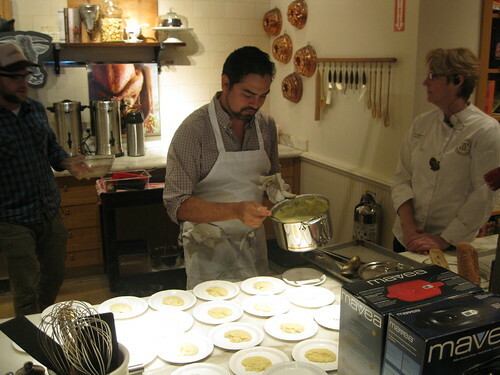 A Williams-Sonoma associate helping plate the Cookbook's mashed potatoes to be paired with the classic beef meatballs he had just prepared. 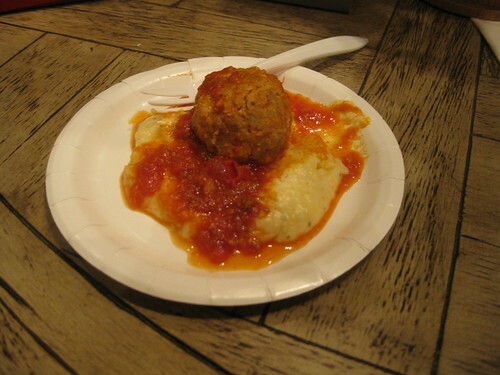 Demonstration sample of a classic beef meatball with classic tomato sauce over mashed potatoes. 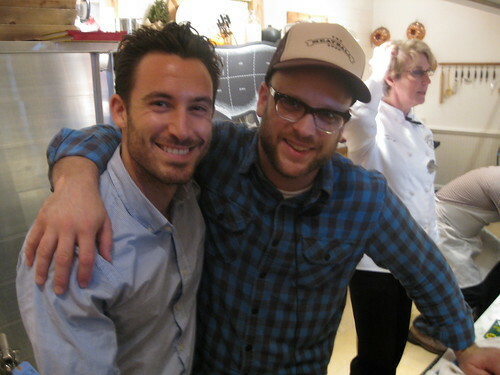 Mr. Chernow and Chef Holzman! Our copy of The Meatball Shop Cookbook! Chef Holzman and Mr. Chernow left us a great message inside the cookbook -- a shout-out to Four Tines and a Napkin, in silver-colored Sharpie, no less! Findings: From Marcus's detailed account of the demonstration and cookbook signing with Chef Daniel Holzman and general manager, Michael Chernow, it seemed to be an informative and fun event to attend! 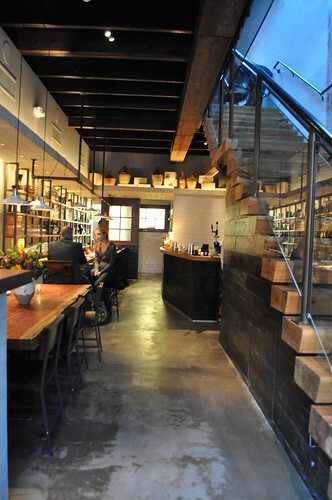 I think what worked best is the two co-owners are so down-to-earth, relaxed, and easily approachable, which makes their recipes, their restaurant, and their personalities appeal very well to the general public. It definitely seems like The Meatball Shop Cookbook will be an essential one in our growing library. In fact, Marcus and I attempted making the jambalaya meatballs this past weekend, and Chef Holzman was right -- they were really easy to make! Just had to lop all of the ingredients thoroughly together, and we really had something on our hands! This will make the perfect addition to any cook's cookbook collection -- for those looking for easy recipes, for those looking for classic and timeless recipes -- the comprehensive collection of both classic and unique meatball recipes, alongside with an eclectic range of sauces, sides, vegetables, and desserts, will satisfy any palate. They picked a great time to release their cookbook -- with Thanksgiving, the holiday season, and the colder weather just around the corner, people are definitely looking for recipes to help keep them warm in the weeks and months to come. 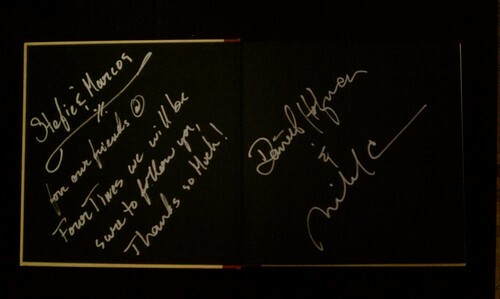 Anyways, I just wanted to thank Marcus for going in my place -- another one for the both of us -- and to thank Chef Holzman and Mr. Chernow for the awesome shout-out in our book. I'm still swooning over it! Price point: $28 for each cookbook. During a brief visit to Philadelphia a couple weekends ago, Marcus, Dan, and I hit up another Stephen Starr restaurant (another to cross off the "Starr Restaurant Tour" list! 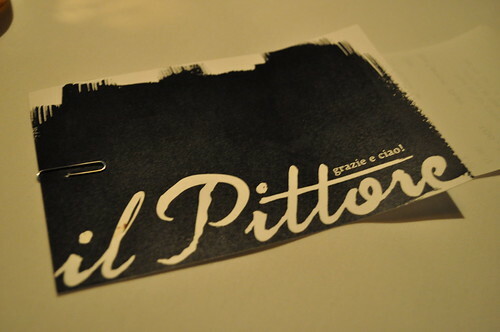 ), Il Pittore, which, at that point in time, had been only open a mere ten days! 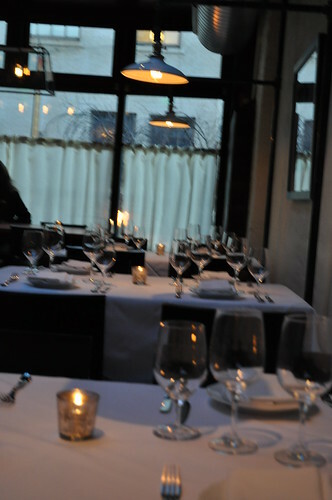 Located on the edge of Rittenhouse Square, Il Pittore, an Italian self-moniker dedicated to its executive chef, Chris Painter, and of course, its focus on Italian cuisine. Notice the restaurant's hanging banner/sign evokes the texture of a European fresco, aptly fitting Il Pittore's painterly theme. 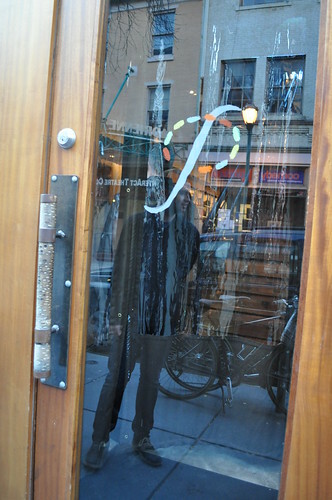 Same with the decal of a "P" on the restaurant's entrance door. Mr. Starr wanted to capture the "romantic spirit" of Italy and bring it to Il Pittore here in Philadelphia. "Its quaint ambiance, created by rich woods, hand-painted murals, black-and-white images of Italian culture, and a rooftop garden," aims to recreate the "cozy feeling of a villa in the Italian countryside." As you see here, the first floor has a dining counter for ten guests and a communal table for eight -- both bringing people "together in a vibrant social setting" to share wine over a meal of pasta. The second floor houses the main dining room which allows guests to have "a more traditional a la carte" dining experience. Another view of the upstairs dining room. 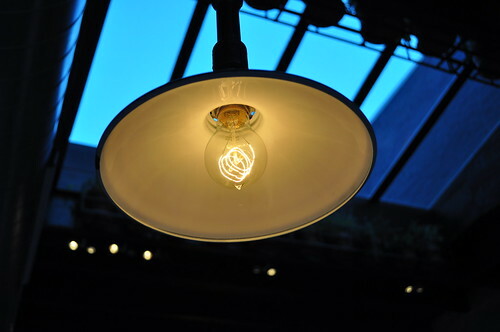 We really admired the industrial/vintage-looking incandescent lightbulbs with the glowing filament visible through its clear glass. Probably my most favorite detail behind Mr. Starr's interior at Il Pittore -- wine list made from canvas board with harsh brushstrokes of black paint. Same style goes for the one-page dinner menus. Chef Painter draws his influences from Emilia Romagna, Piedmont, Tuscany, and Sicily. The chef's "culinary artistry" paired with the "fresh flavors of Italian ingredients" hopes to convery a "truly modern menu" at Il Pittore. 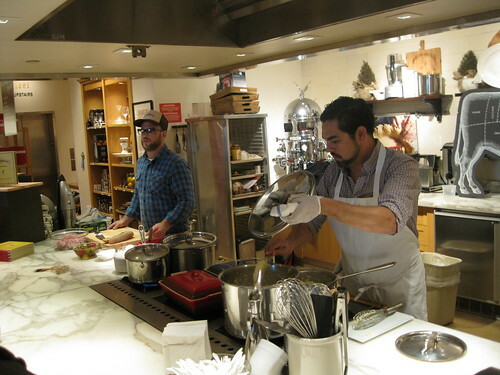 Before he ended up at Il Pittore, Chef Painter had worked in Portland in 1998 as well as staged at The French Laundry and Lespinasse. A year later, he joined STARR Restaurants to become the executive chef at the now-closed Tangerine, which focused on the diversity of Mediterranean flavors. Then in 2003, he served as executive chef of Angelina, another now-closed Starr creation followed by a consulting stint with the PJW Restaurant Group, which lead to an executive chef position at Izakaya in Atlantic City. Chef Painter returned to STARR Restaurants in 2008 as culinary director, where he served in an advisory capacity in collaborating with the chefs at each of Mr. Starr's restaurants to assure that each restaurant upheld top-quality standards. Now with Il Pittore open, Chef Painter has another challenge on his hands. 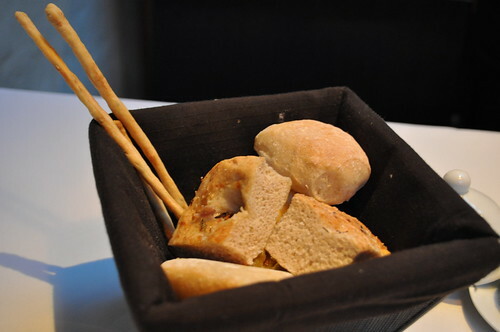 Bread basket filled withe breadsticks, foccacia, and ciabatta. 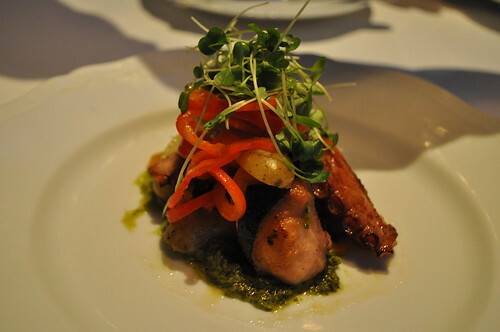 To start, I had the polpo brasato -- braised octopus with pickled sweet peppers, potatoes, and arugula. The octopus was braised well with a nicely charred exterior. It had some great flavors overall with the octopus's texture a little bit chewy but still soft. The pickled sweet peppers were slightly briny, adding a nice salty and vinegary taste to the dish. Pretty good, I'd say, if you enjoy octopus. 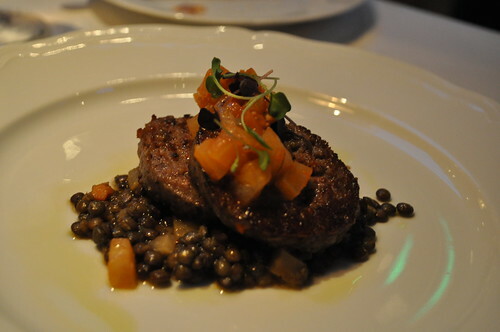 Marcus and Dan each both had the salsiccia d'agnello -- spiced lamb sausage with lentils, sundried tomato, and fennel. Though this was fewer in pieces, the spices and flavors pervaded throughout the dish -- bold and hearty from the autumnal game of lamb and other ingredients. Dan and Marcus raved about how great this was, so I snagged a small bite from Marcus, and they were right. Great starter dish for the fall season! Pasta was calling my name for the main course, as I decided to go with the ravioli di ricotta e verza -- swiss chard and ricotta-filled ravioli with chanterelle mushrooms and truffle butter. 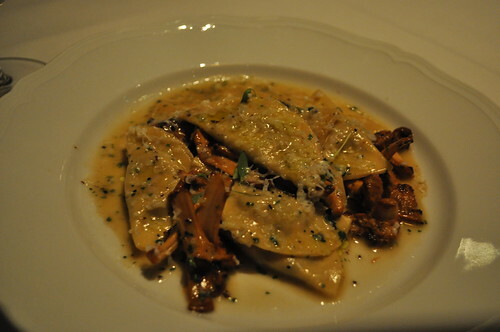 I absolutely loved this dish --the truffle butter carried throughout the packets of ricotta-filled pasta, fragrantly complementing the ricotta and chanterelles. The sauce was lovely as well, perfectly drizzled to add a little moisture to the pasta dish. Only complaint here is that I asked for the main course portion, as the menu version is strictly appetizer-sized, and I still felt like the portion was very small. I could've eaten double what was served! Nevertheless, the ravioli was awesome! 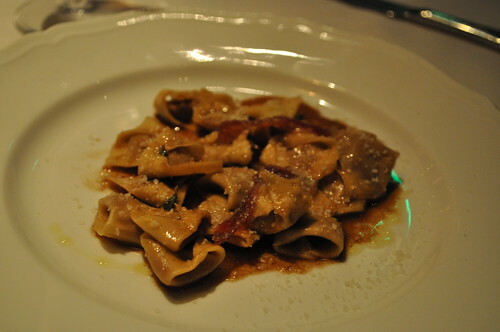 Marcus had the agnolotti d'anatra -- duck-filled pasta pillows with juniper cured duck prosciutto. The agnolotti was hearty dish to have during the fall season, as it was very sweet, salty, and savory inside the softly made pasta pillows. Marcus gobbled this all up with the same complaint I had -- portion definitely could have been larger for the main-course size. 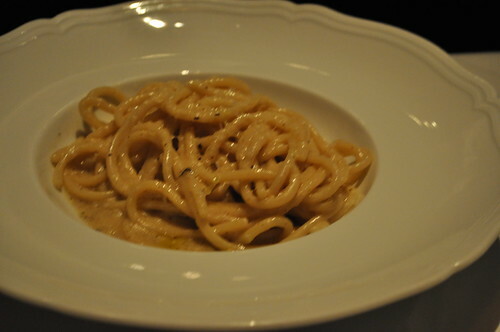 Dan had the cacio e pepe -- spaghetti with pecorino romano and black pepper. Don't let the simplicity of this pasta dish deceive you -- it was the simplicity here that really brought out the fresh flavor of the handmade pasta, only to be enhanced by the pecorino romano and black pepper. 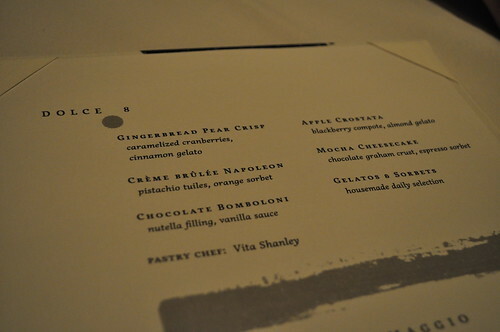 I love how the menus (dessert, above) have the subtle paint theme throughout its layout. 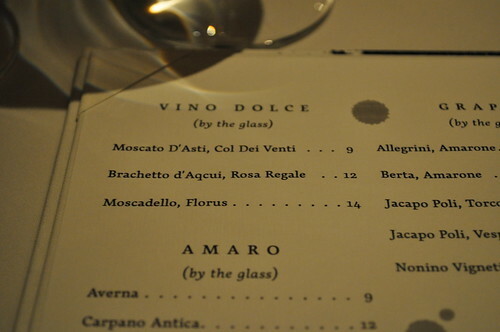 I decided to go with a nice glass of moscato d'asti as my "dessert" -- something that always is reminiscent of biting into a freshly ripened stone fruit. I thought that would be a nice way to end our meal. 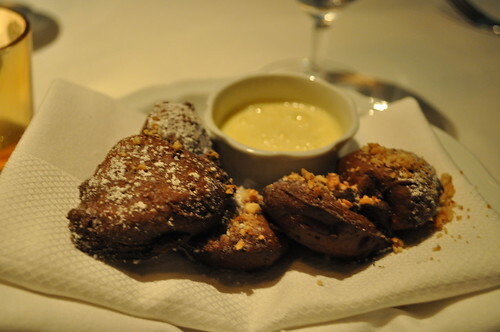 For dessert, Marcus couldn't resist ordering the chocolate bomboloni with nutella filling and vanilla dipping sauce. I stole a bite of these, and it was very much like ebelskivers, i.e., sphere-shaped, Danish pancakes. The nutella center was nice and creamy with the bamboloni exterior slightly burnt, as warmed against the vanilla dipping sauce. 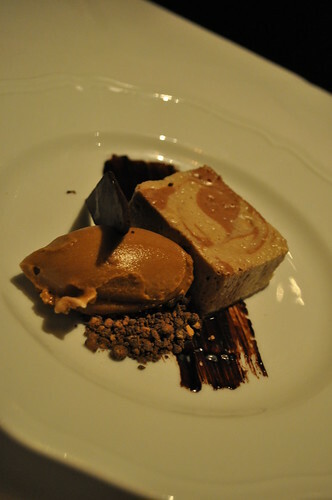 Dan had the mocha cheesecake with a chocolate graham crust and espresso sorbet. This was very interesting as well -- almost like a mochaccino paired with chocolate biscotti, only in cheesecake/crust/sorbet form! If you're a coffee-lover, this dessert should be very appealing to you! 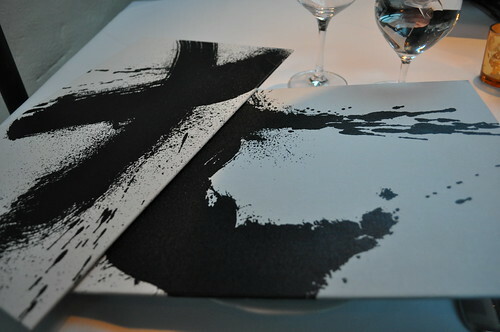 What I also like about the presentation here is that the chocolate sauce on the bottom appears like a harsh brushstroke, reiterating the restaurant's ode to "The Painter" -- very awesome! Even its check holder/postcard is stylish and painterly! Findings: I would say that Marcus, Dan, and I had an overall lovely experience at Il Pittore. 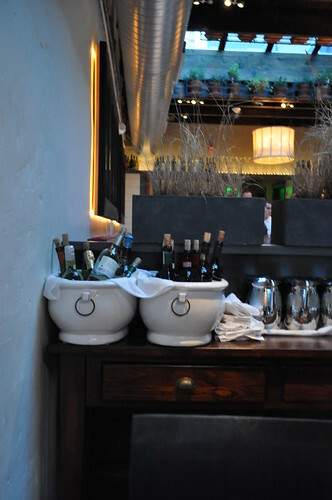 We were very content with flavors and presentation the antipasti as well as the primi/pasta dishes we selected. The restaurant's detailed interior design was very impressive -- nothing short of what Stephen Starr has demonstrated with his current repertoire of establishments all throughout Philadelphia. 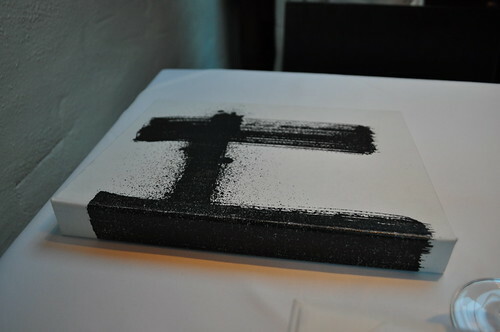 The painterly theme was executed very well, from the frescos to the canvas board menus with harsh brushstrokes. The two things, however, that we were not crazy about were the small "main course-sized" pasta portions as well as the service. While portioning is up to the kitchen's discretion, I felt that the service could have used a little work. In my experience, all the waitstaff that I've encountered on my many food adventures have usually been quite informed on the restaurant's many menu offerings, and if they were unsure, they would typically admit that, apologetically, say they would find out from the kitchen for me. 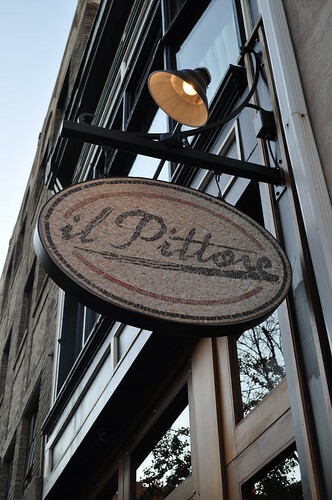 Perhaps it's just part of the kinks of the first opening weeks, but I felt a little unwelcome to ask questions about Il Pittore's menu when I had asked about a few of the menu items. The response we received from our primary server was confused, impatient, and slightly dismissive. Maybe it was just nerves of working at a new restaurant, but if a server doesn't know the answer to a patron's question, he or she say that they're unsure, that they will direct the question to the kitchen or to someone who may know, and that they will get back to you on it. I'm going ot attribute this confusion to the recent opening of Il Pittore -- I would definitely go back to reassess more accurately at a later date. Nevertheless, minus the initial mishap I had here when we were contemplating our dinner orders, the service we received was very good and attentive. The quality of the food was great, and the company even better. Price point: $13-14 for each antipasti, $13-16 for each primi/pasta, $8 for each dolce. After a delicious taco dinner at Dos Toros Taqueria, we passed by popbar, a dessert shop that I've been meaning to visit. I had no idea it was right near Dos Toros in the West Village, so it was a nice surprise for dessert. 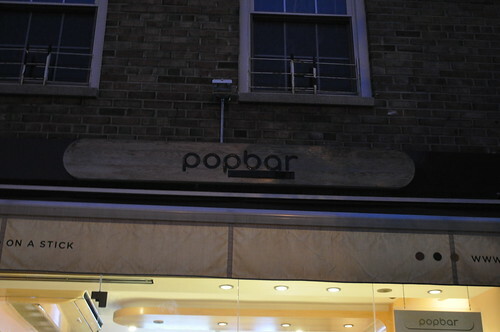 So popbar's specialty? It is handcrafted gelato on a stick (along with "popsicle bars" --thus the name "popbar," I gather -- made from other churned confections which include sorbet and yogurt) made from all natural ingredients. All of its popbars are Kosher certified, gluten-free, and preservative-free with no artificial coloring. All of its popSorbettos (i.e., sorbet on a stick) are lactose-free and vegan-friendly. Love the store's signage -- a popsicle stick! Sheer brilliance! Look at that splendiferous display of multi-flavor and multicolored beauty -- wonderfully crafted bars of chilly perfection waiting for its beholders to salivate and to order to go. It was so hard to decide, which just ended with me selecting only one, promising myself I'd come back frequently to try the other flavors. What's even cooler is that popbar has a menu item called mypop for which you can create your own personal popbar starting with a basic popbar (flavored and plain). You then select your "poppings" (i.e., toppings, which includes an assortment of nuts, sprinkles, granola, and shredded coconut) and your "signature dip" (which includes dark chocolate, milk chocolate, and white chocolate). The basic popbar will get dipped in the "signature dip" and covered in the selected "poppings," yielding numerous combinations of popbars to create! 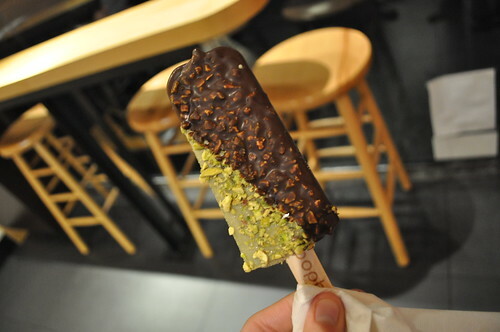 With too many decisions to make, I decided to keep it simple that night and went with the Pistachio Premium, a popGelato covered with freshly chopped pistachios and half-dipped with signature dark chocolate. And it tasted exactly as it looked -- a blissful whirlwind of crunchiness from the shell of dark chocolate and the crushed pistachios. What I liked so much about this popbar is that the gelato stayed in tact (i.e., didn't melt away in seconds) and that the chocolate shell had a lovely thickness to it. 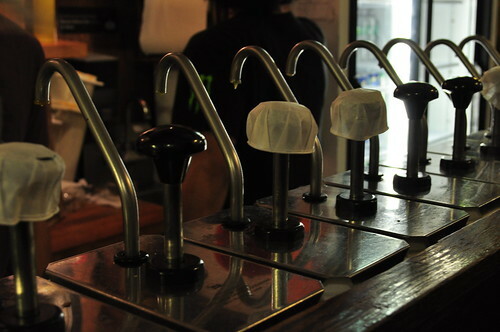 So if you are looking for a new way to have your fixing of gelato, popbar is the place to go! 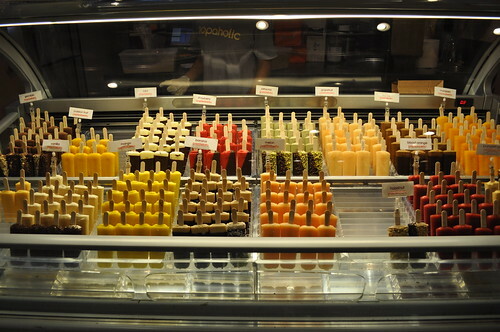 Findings: While the prices at popbar are a bit on the high end, I think the quality of the ingredients along with its well-crafted popsicle bars can arguably justify the price point. I like that there is a "create-your-own" option, making the menu very versatile to satisfy any palate at hand. What really got me was the total inundation of pistachio flavor that I experienced with the Pistachio Premium popGelato that I ordered. It was quite heavenly as the freshly chopped pistachios really brought out the flavors of the gelato and gave it a great overall crunch with the dark chocolate "popping" -- just delish! I'm hoping to go back once more before the year's over -- perhaps to try a popSorbetto or be audacious enough to concoct an original "create-your-own" popbar. Price point: $4.50 for each Premium popGelato. Per an insistent recommendation by my co-worker, Elan, Dos Toros Taqueria has been on my list of places to try before the end of the year. So when I saw this LivingSocial deal (i.e., $20 to spend on food and drink at Dos Toros for only $10! ), I nabbed it so Marcus and I could finally go try it together. Elan said he prefers going to the Union Square location, but as the LivingSocial deal was for the West Village location, that is where Marcus and I ended up going. Love the "T" in the Dos Toros logo -- minimalist, serifed bull horns! 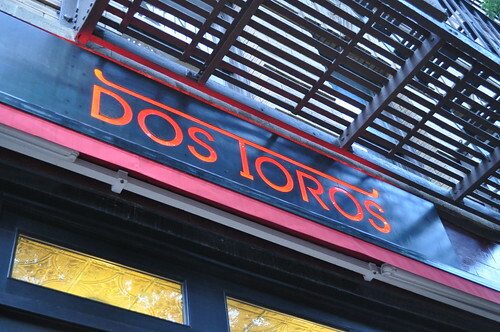 Leo and Oliver Kremer, originally from the San Francisco Bay Area, started Dos Toros here in New York City. Growing up, the two brothers ate at their favorite taqueria nearly every single day of the week. Later, upon venturing to the East Coast, they were shocked to discover that the same stuff simply was not available, which inspired them to come up with Dos Toros Taqueria. 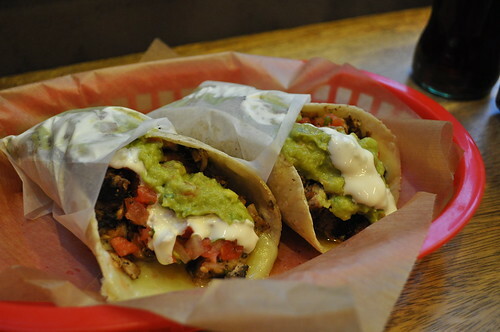 The Kremer brothers has made the focus of Dos Toros to be obsessively about food, spending countless hours perfecting the taqueria's recipes and sourcing fresh, high quality ingredients from local vendors. 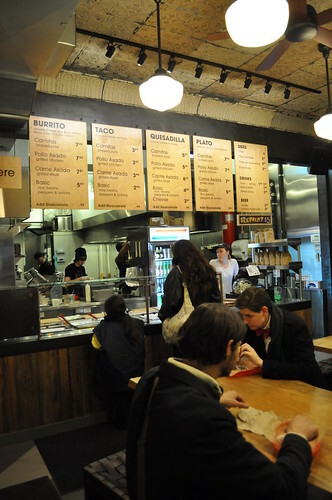 The interior of Dos Toros is a combination of custom light fixtures pairs with counter tops made from reclaimed wood. As for the menu, the Kremer brothers is proud to say that it is "short and sweet" in that you can "spend mroe time eating and less time trying to figure out what to order." There's a choice from burrito, taco, quesadilla, and plato as well as the respective protein (e.g., carnitas, pollo asado, carne asada, and rice/bean). Per Elan's sole recommendation that I "HAD to get the crispy chicken tacos," I, in fact, got the crispy chicken tacos -- crispy meaning the tortilla is heated and grilled slightly with some cheese before plopping on the protein (chicken, in this case) and the token condiments (sour cream, salsa, and guacamole). Oh man -- these tacos were out of this world! Toasting up the flour tortillas with a little bit of cheese made a big difference for the tacos at Dos Toros! The chicken had a nice char to it. The condiment combination of guacamole, salsa, and sour cream were really dynamic in flavors, mainly because you can taste the fresh ingredients used in each. The avocados mashed within the guacamole were rich and buttery while the tomatoes in the salsa were fresh and juicy. The sour cream was a nice unifier of the salsa and guacamole -- it was just enough to get that mildly sour taste going with the rest of the taco. As someone who has a very hard time eating, enjoying, and digesting Mexican food, Dos Toros is a beacon of hope. The tacos did not feel like one big gloppage of Mexican condiments all mixed in with chicken you can barely taste because of the condiments' flavors drowning and overpowering it. By the time I finished them, I was already craving some more! Marcus not only got a crispy chicken taco but also a crispy steak taco. Elan was right -- the crispy chicken taco simply dominates taco side of the menu. Nothing supercedes its sheer deliciousness. 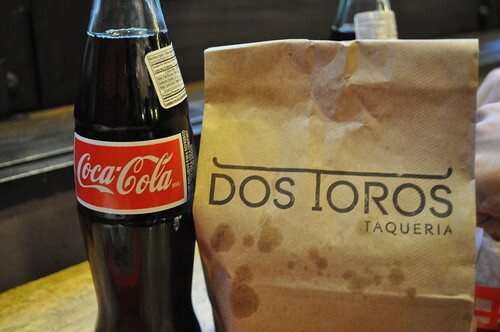 Along with our tacos, Marcus and I shared a Mexican bottled Coke and a bag of chips. Findings: I was very impressed with the crispy chicken tacos over at Dos Toros. It not only is crispy (love, love, love that they warm up the tortilla with a little cheese prior to filling it), but it boasts the freshest of ingredients (juicy tomatoes and ripened, buttery avocados) wrapped in its interior. 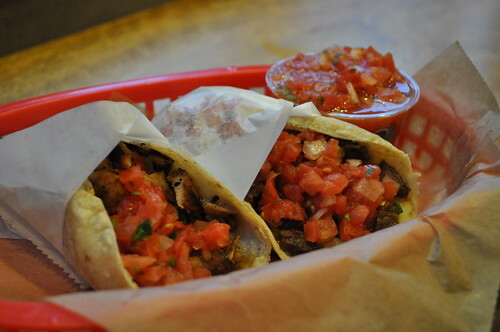 Definitely will come back to Dos Toros when I'm craving some tacos! So if you do make it to Dos Toros, do yourself a favor and order dos crispy chicken tacos. You'll be glad you did. Kudos to Elan for this great recommendation! Price point: $7.35-7.81 for each taco, $2.30 for a bottled drink, $0.92 for chips.